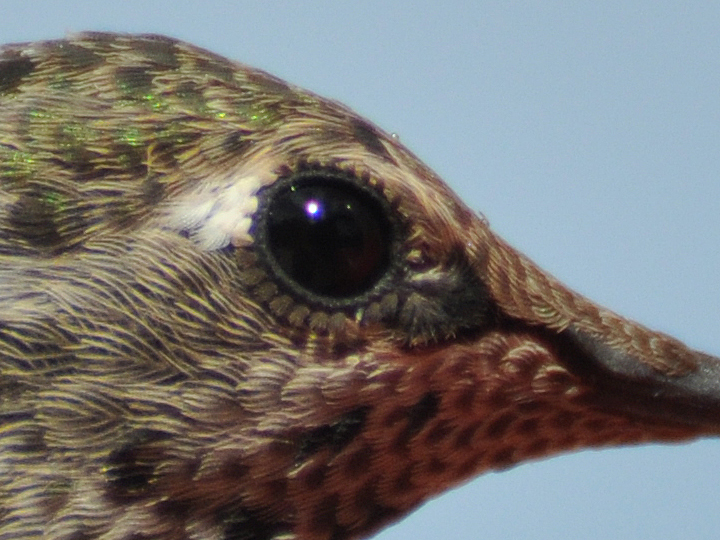 This shot shows coloration behind the eye. The crown matches the gorget. The bill is straight or almost so. 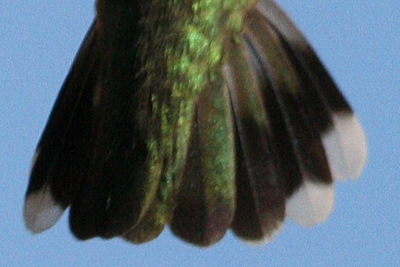 As the male ages, its gorget extends at the corners. 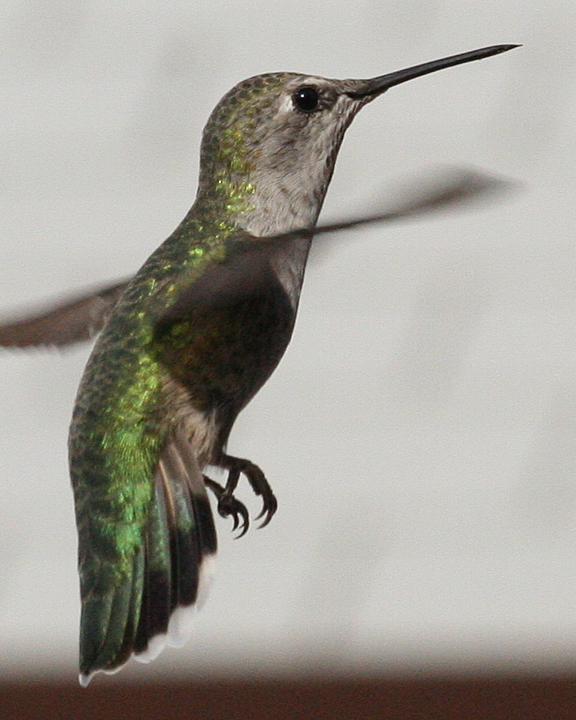 The white tuft on the shoulder of this bird is an oddity (flash used). A year later I caught this adult male. 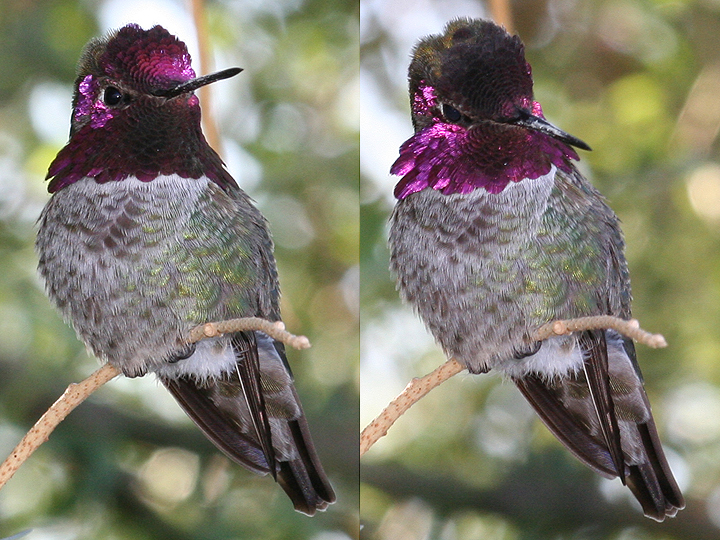 Depending on lighting conditions the bird sometimes shows purple (flash used). 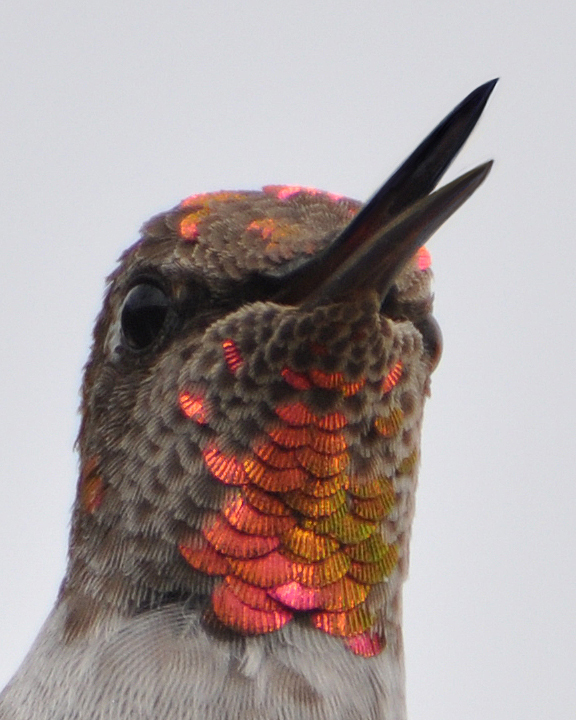 Hummer iridescence is optimized when the sky is overcast. 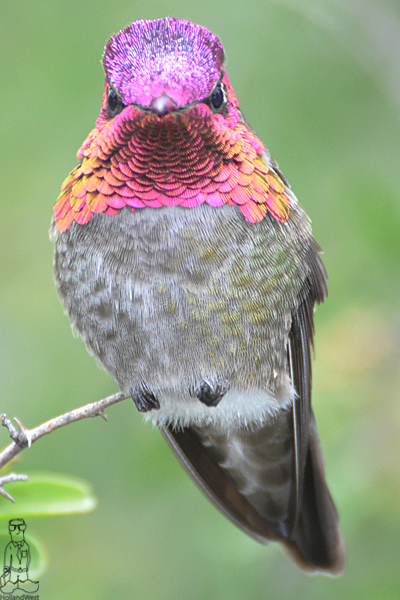 Most of the mature male Anna’s look more like the bird below with no extensions on the gorget. 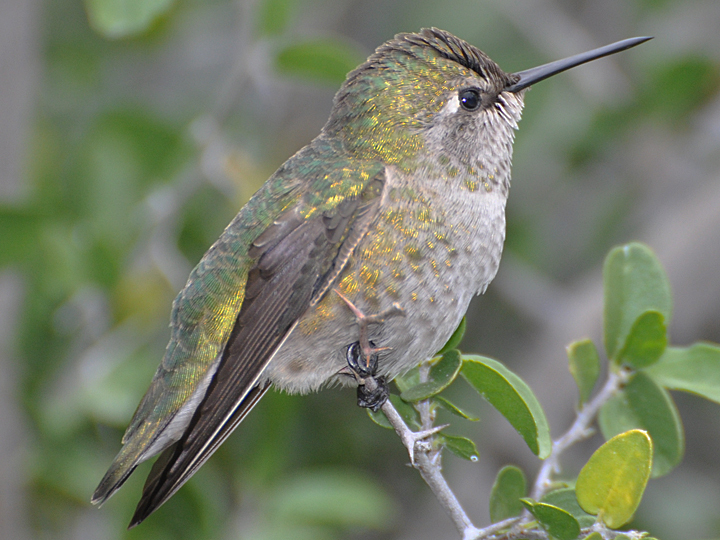 The below shot is of an Anna’s Hummingbird male hatch year. 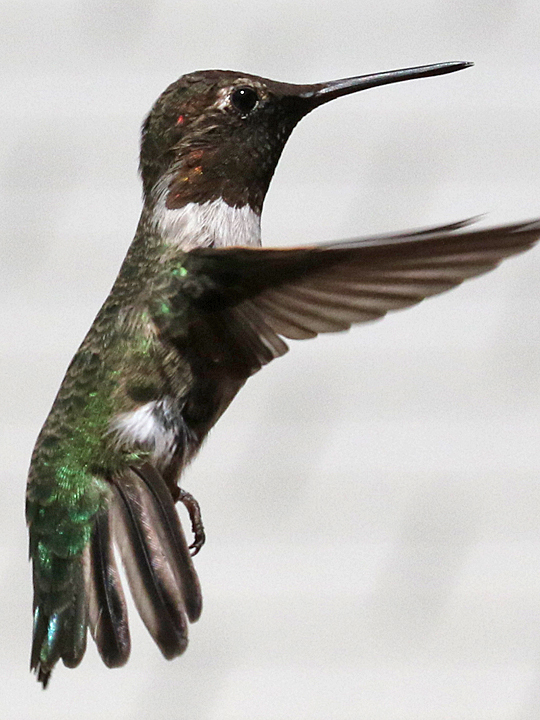 Note the halo at the end of the immature gorget feathers and that the entire throat is covered. This bird is likely less than 6 months old. 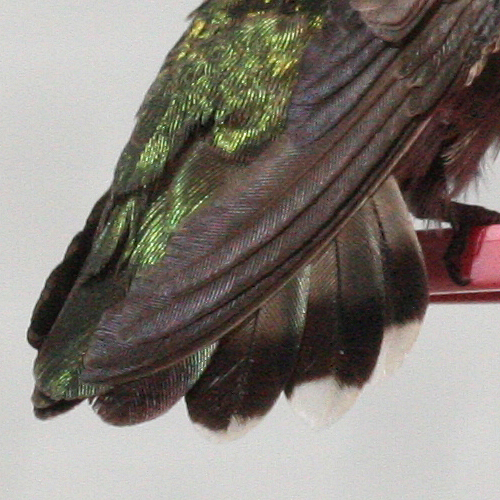 The backs of Anna’s Hummingbirds below, note the crown on the male on the left. 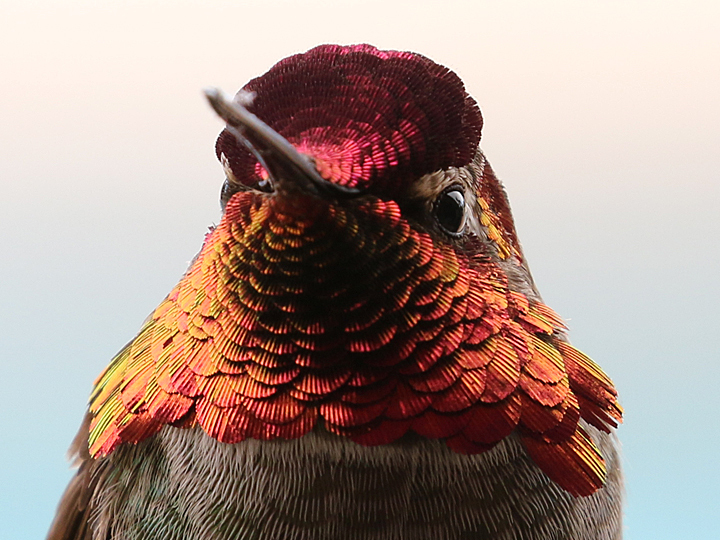 Anna’s Hummingbirds molt in late summer. 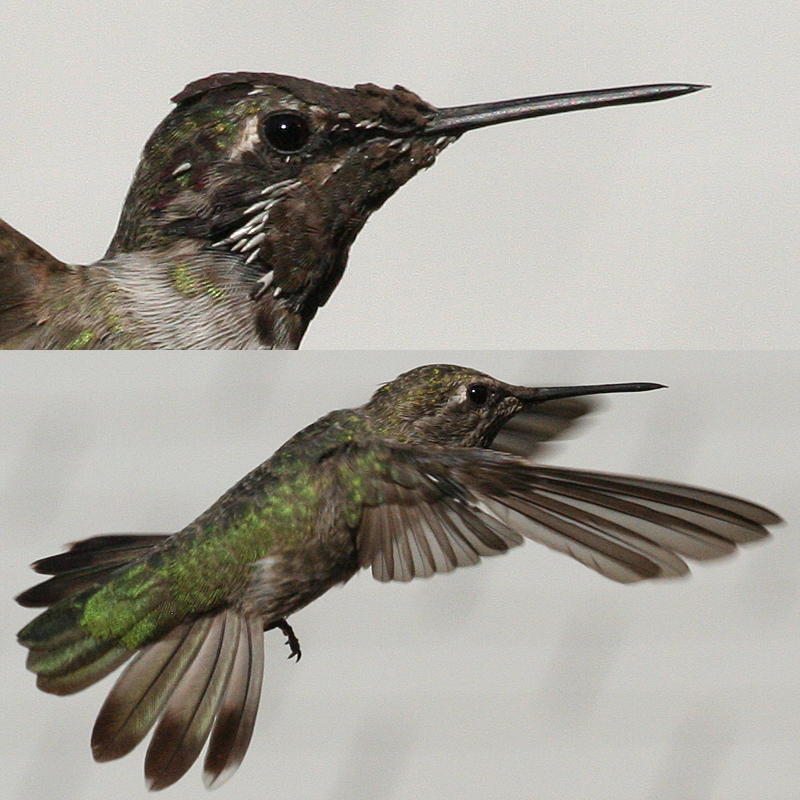 The top bird in the following pictures is a mature male in mid molt of its gorget. 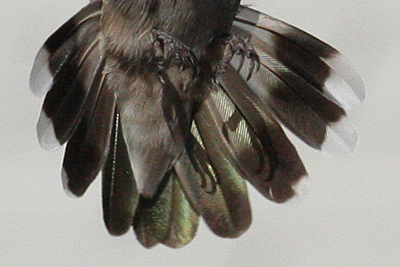 The bird below it is a hatch year male who’s wing is in mid molt. 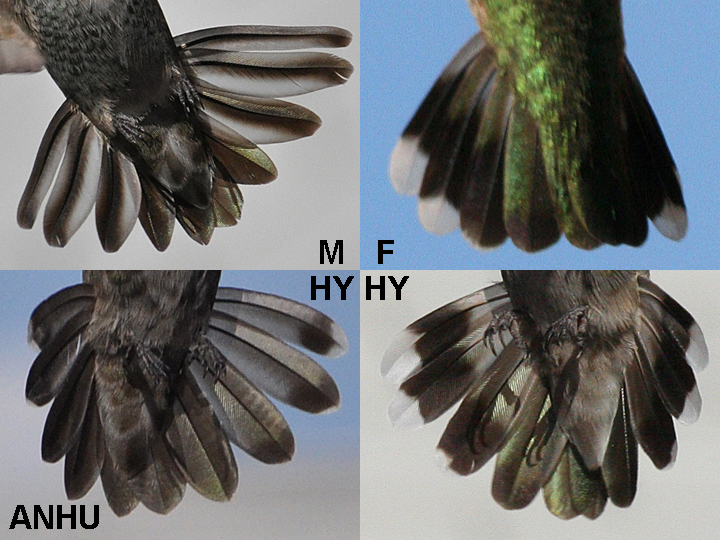 Note that a Costa’s male AHY tail looks a bit similar, but R5 is more narrow and has an inward curve. 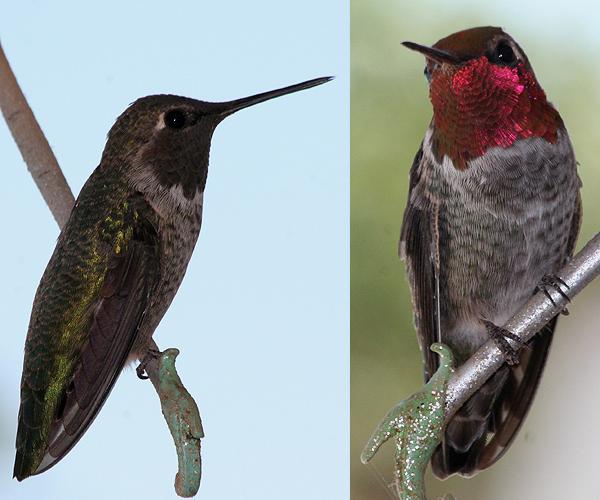 Note the difference between the R4 on this hatch year male vs the females which are rounder. The slight point is my observation and is not supported by various texts. 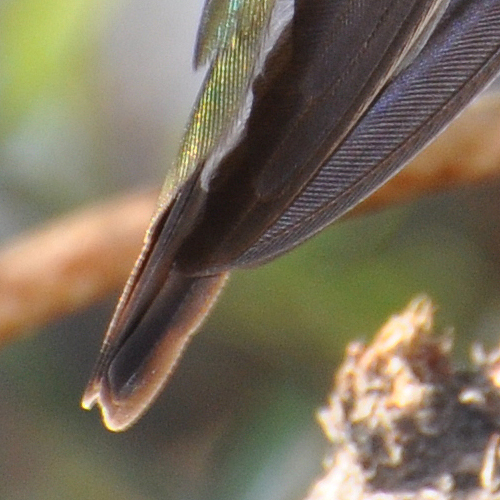 The female tail closely resembles the hatch year male. R5 tip is clean, R4 has a black tip. Note that the sub-terminal black on R3 is offset. White on R3 much more prominent than FAHY. 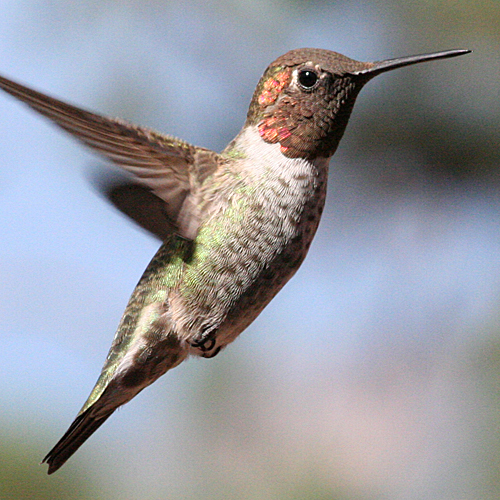 Another way of differentiating species of hummingbird is by their wings. 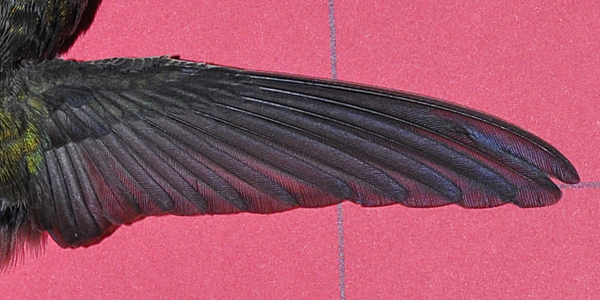 The shape of the feathers, size of them, the position of the rectrix and the length of the wing in proportion to the tail. This photograph was taken postmortem. Note that P10 (outermost) is more narrow than P9. P9 through P4 are approximately the same width. 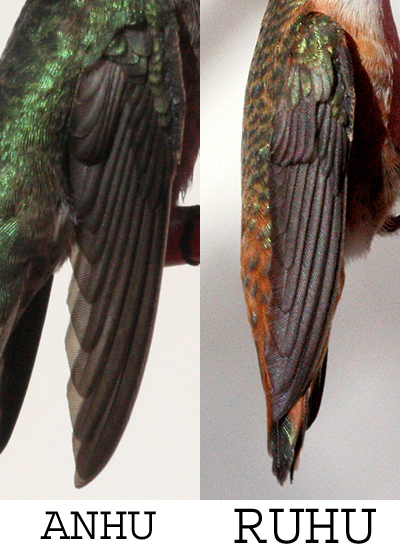 Another diagnostic is the tail vs wing length. 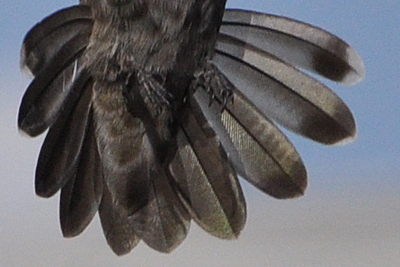 As can be seen in the tail shot below, Anna’s tail length is long, extending well beyond the wingtips for an adult male. 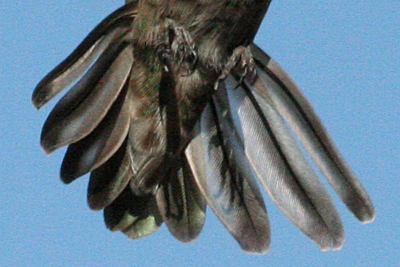 For a female, the tail extends to or beyond the wingtips. 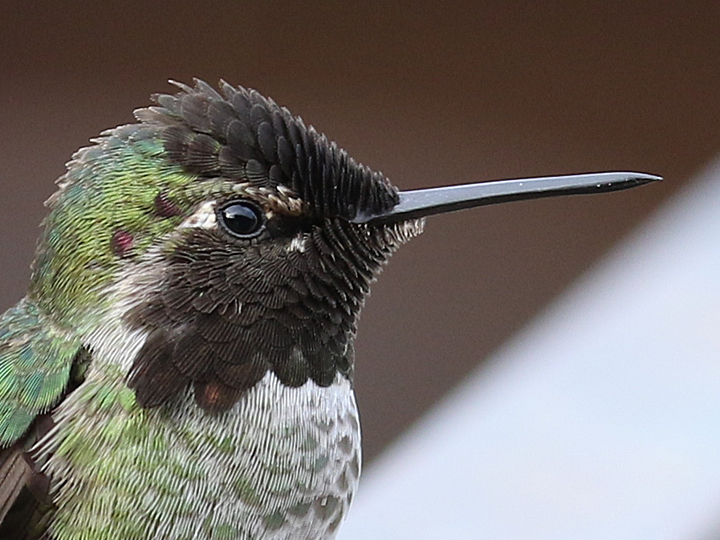 Does an Anna’s Hummingbird have eyelashes? 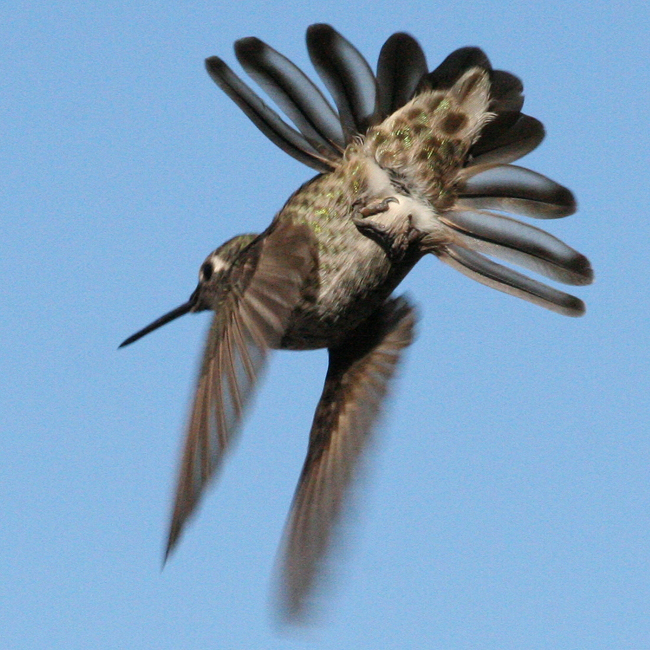 An AHY male from Hassayampa River preserve (flash). 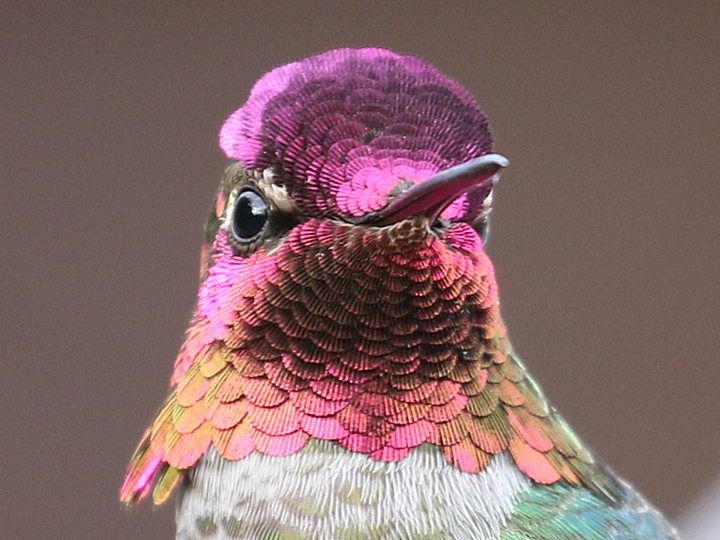 Males use their iridescence as both an attractant for mating rituals and warnings to their rivals. 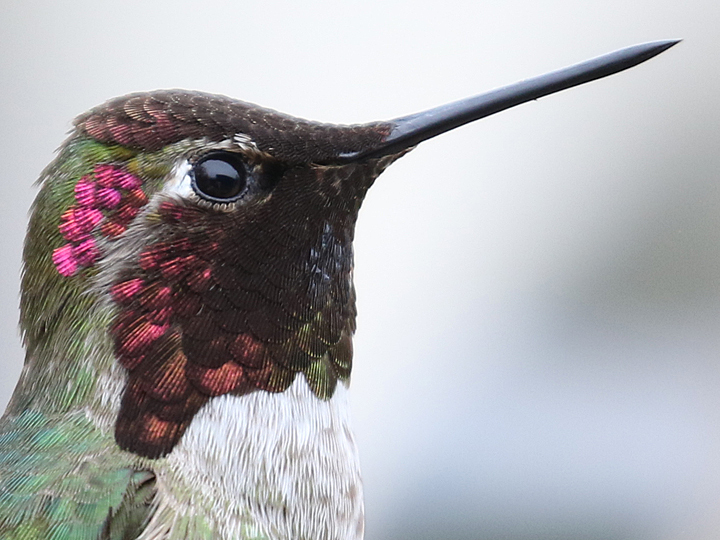 At rest, their crown feathers lay flat on their head. They can raise them as the need occurs. 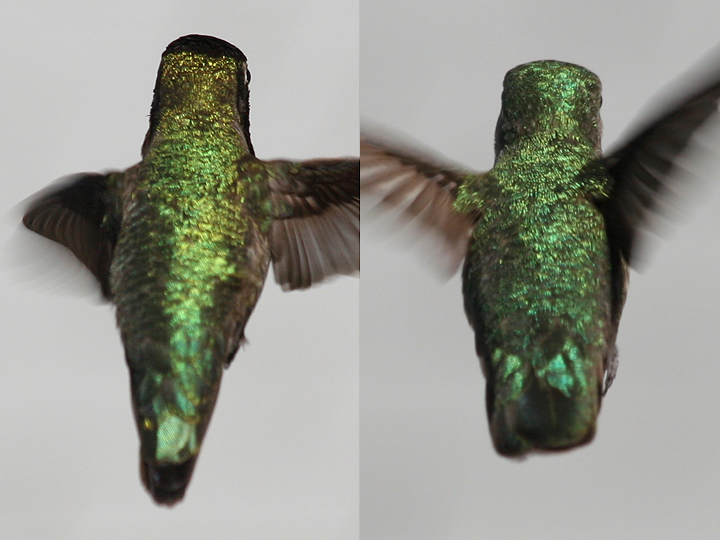 When the weather is cloudy, iridescent shots improve. 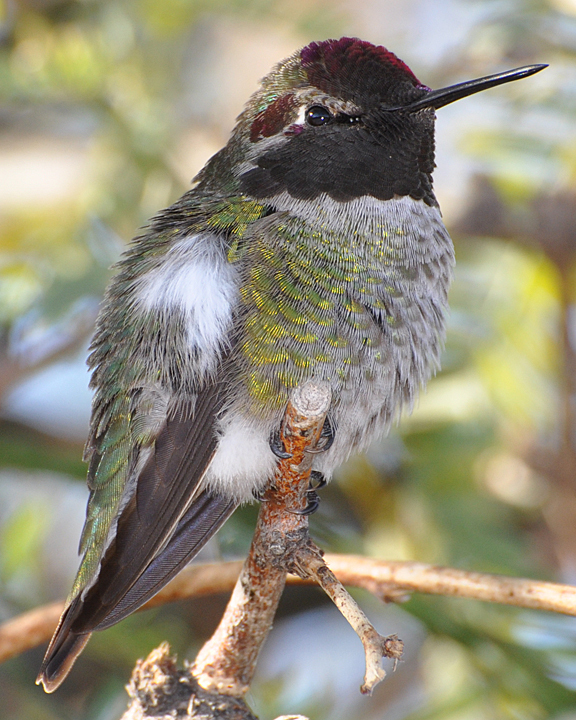 An after hatch year male on our patio. 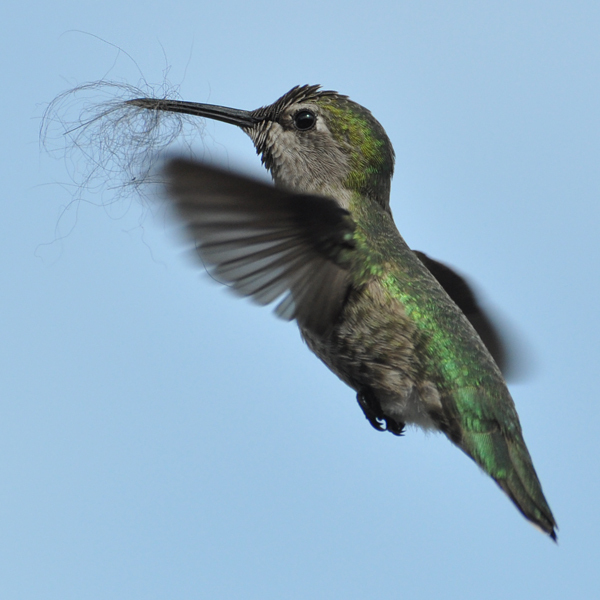 Anna’s gathering nesting material, dog hair. Excellent work! Thanks for posting these wonderful images and text. It would be nice to know where the photos were taken and roughly when (i.e., even just the month), and who you are (i.e., a little background info). PS I love your “handle” Zoutedrop! Absolutely stellar photography and documentation. Agree with the reader’s comment requesting a ‘when and where taken’ notation be added to the photos. Keep doing what you’re doing!